This next story is a bit longer than I had originally planned. I hope that by telling this, others can find some solace in the fact that they are not alone with the hurt that they are feeling in relation to the untimely ending of the Indian Pacific Wheel Race. I only recently became interested in long distance cycling after hearing about the IndiPac. I had seen a few videos relating to the TransAm and Transcontinental races, but they didn’t initially capture me. The IndiPac however was different and the challenge of riding across the continent of Australia was enthralling. I had flown across the Nullarbor numerous times and knew the vastness of the area. This knowledge invariably led me to appreciate the other races and learn the name, Mike Hall. I started to watch numerous YouTube videos to learn what I could about him and his competitors. I was so inspired by the IndiPac, that I made a personal commitment to ride from Adelaide to Melbourne. The timing would be perfect. The IndiPackers, if they rode 400+ kilometres a day, would be on the same part of the course as me at a similar time. Unfortunately for me, early on in the race both Kristof Allegaert and Mike were smashing it, and it looked likely I would miss them. I saw Kristof in Adelaide on the Friday before I was due to depart. I knew I would not see him out on the road. Unfortunately another appointment meant that I would not get to see Mike until Melbourne, if I was lucky enough to. The morning of the ride, I made a couple of mistakes and left about 10 minutes behind schedule. Watching the tracker it looked like Mike was resting at Tailem Bend. We were about three and a half hours from there when we set out, and given how little sleep the riders were taking, it seemed obvious that Mike would be well on his way before Dazz and I could rendezvous with him. Kristof was up the road and with little wind, every hour would add 30kms+ to Kristof’s lead, of course Mike would hit the road soon. We rode on and took in the beautifully quiet starlit morning. As we got closer to Tailem Bend I had a quick glance at the tracker and saw that Mike was still there. We boarded the ferry to cross the Murray River and took a well deserved breath. I was busy texting home and taking in the scenery when the ferry docked at the other side of the river and we were off. A couple of hundred metres up the road, I checked the tracker again. Devastation! Mike’s last known point was about 2 kilometres down from us and he was heading in the wrong direction. We had missed him. We continued onto Tailem Bend where I rued the lost opportunity of riding with Mike. I would have to try and ride with him back in Melbourne, as long as I made it in time. I still had 700kms to go. There were numerous issues that I had on the road, which saw me not end up completing the ride. I made it close to half way. There were a couple of positives of pulling the pin early, as I would be able to ride with Kristof, Mike and Sarah Hammond as they came into Melbourne. I could have done this regardless, but at least I knew I would be able to sit on the saddle, which I can’t honestly say I would have been able to had I completed the full ride! I missed Kristof as I was taking my wife to an appointment. I vowed I would not miss Mike. As the time drew nearer a massive storm blew across Melbourne. I was waiting for my wife to return and for my daughter to finish school. Damn! I was glued to the tracker and was getting more and more impatient. Slow down Mike! I got dressed and was ready to roll so that I wouldn’t lose any time after picking up my family members. We got home and I rushed inside to get my bike. Within 30 seconds of leaving home, I could not have been wetter. The rain was torrential with lightning and thunder making the ride lively. I thought about turning around and immediately dismissed it as I knew Mike was in it too. If he was out there experiencing the same conditions, I couldn’t chicken out after 2 kms! I saw a couple of people waiting for Mike alongside the bike path that made up the last part of the route before the final run into Melbourne. As they were still there, patiently waiting, I knew he hadn’t passed, so kept riding into the headwind I had fought since hopping onto the bike. I rounded a slight curve and noticed a bright light up ahead. Could it be? Yes, it was. He cruised past faster than I was expecting, so I did a bit of off road riding to conduct a quick U-turn and chase him down. I pulled up alongside and told him that he was doing a great job and that I would sit back and let him go about his business. After we passed the photographers I had seen earlier (I didn’t want to ruin their photos with my ugly head! ), I pulled up alongside again and had some general chitchat. Mike looked tired but was in good spirits. He was looking forward to getting through Melbourne and being able to eat. 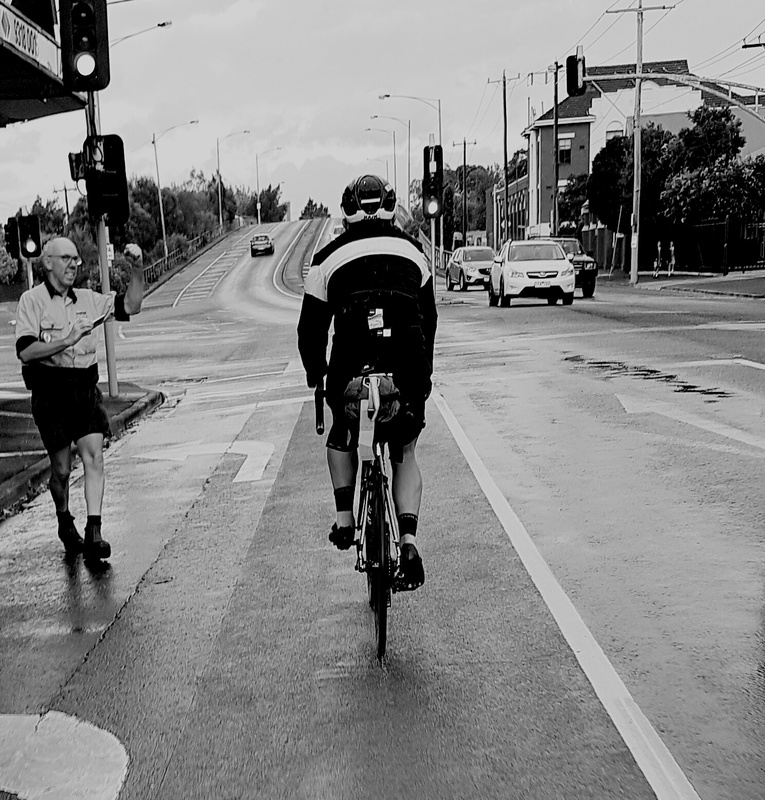 As we rode along some wet roads in peak hour traffic, he had many people waving and calling out. I can’t recall one instance that was not acknowledged by Mike with a wave or smile. I rode behind him to the edge of the city before rolling up alongside to wish him well. He said thanks and returned the sentiment. I turned for home. I was saturated, but over the moon as I walked in the door and regaled my encounter to my wife and kids. Like most people, I was a dot watcher for the next few days. I was in Sydney for work on Thursday and it was looking like, if everything went well, I might be able to see the finish at the Opera House the next day. I woke up a couple of times during the night and it became apparent that this wouldn’t eventuate as both Mike and Kristof seemed to have taken some time to prepare for the final onslaught. I woke in the morning and went to work. At work I was busy all day and only managed to get a couple of looks at the tracker. It looked like Mike was tired from the days before and had stopped just outside of Canberra. I assumed that he had come to realise that he would not beat Kristof and was taking the time to rest up and enjoy the last bit of the ride to Sydney. Kristof didn’t seem to be moving either. C’mon Mike, get moving, now’s the time. I said my farewells to my colleagues and encouraged a couple of them to get down to the Opera House that night to see the end of the race and went to find a taxi to the airport. After settling into the cab I decided to check Facebook only to see a comment mentioning Mike’s passing. I was dumbfounded. I couldn’t comprehend the news. I immediately googled Mike’s name hoping that it was an error, that there had been some mistake. Unfortunately it did nothing more than confirm the incident. The tracker had been telling me a horror story all day long that I had not even considered. I spent the next few hours until I got home in a haze. I walked in and started discussing Mike’s passing with my wife. I thought about how worried my wife would be with each ride I did, and about how I was a better husband and father after being out on a ride after burning off the stresses of the work week. I realised that despite Mike’s passing, I wouldn’t be able to stop riding. I certainly hadn’t stopped after being hit myself and countless other close calls. I went to bed vowing to get up in the morning and ride in honour of Mike. I did this by riding into Melbourne with another IndiPac competitor, along the same roads that only a few days earlier I had shared with Mike. This time though, the route felt raw and exposed. There were many tribute rides over the weekend all around the world, with thousands of people riding in support of an environment where cyclists can feel safe and their loved ones are not filled with fear every time they head out of the door. I am just a guy who over the last few months has come to respect Mike’s achievements and also had the opportunity to see the sportsman. A sportsman whose humble approach made an average cyclist like me, feel comfortable to ride beside him. I was not riding alongside an ego, but rather just another cyclist out doing what he loved. We rode side by side for perhaps one kilometre, but he let me ride side by side without making me feel that I was beneath him. I am glad that I got to share the same bit of road as him for a few moments. Moments that will live with me forever. It is too early for a decision to be made on the future of the IndiPac, but for mine, I hope that the race goes on and that there is a trophy awarded to the winner bearing Mike’s name. I, for one, am aiming to be on the start line next year.